From the days when pioneers traveled by horseback and covered wagons, a portion of the land at the northeast edge of Paris, Illinois, has served as a burial ground. According to local legend, the first burials occurred on the site prior to 1800. These early burial spots predate the state of Illinois (1818), the establishment of Paris as the seat of Edgar County government (1823), and the years when young Abraham Lincoln traveled the Circuit of the Eighth Judicial District as a young lawyer on horseback (1847-1857). In these early days, travelers in wagon trains often camped on the high ground east of the current cemetery as they traveled along The Chicago Trail from the northern parts of the Illinois Territory into the southern parts of the Indiana Territory and beyond. The local portion of this old trail passed through the Wabash River Valley adjacent to the cemetery on the east, now known as High Street, and connects Paris and southern Indiana by way of the Lower Terre Haute Road, also a previous portion of The Chicago Trail. When a traveler had the misfortune to die en route, or an early settler succumbed to disease and death, the body was taken to the west side of the old trail for burial in what is now the oldest part of Edgar Cemetery. This area of the cemetery is the unmarked "Section X," sometimes called Paupers' Field or Potters' Field. Stories handed down from previous generations tell the story of the establishment of Edgar Cemetery which encompasses the pioneer burial grounds. 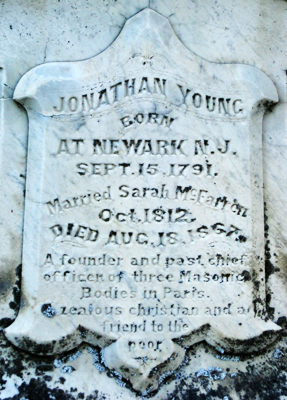 The early burial ground was originally established on land belonging to a man named Jonathan Young. After several bodies were interred there, Young donated the burial grounds and two acres for use as a cemetery in 1858, and named it Edgar Cemetery. The Young Family is buried on the southeast slope of the highest point in the cemetery. On his tombstone, Young is remembered as "a zealous Christian and friend to the poor." His gift of land formed the nucleus of today's Edgar Cemetery. A Cemetery Association was formed in 1858 and oversight continues today from a volunteer Board of Directors. It was not until 1888 that Edgar Cemetery was chartered with the State of Illinois. The cemetery is the final resting place for many ancestors of this east-central Illinois rural farming town and the smaller surrounding communities. Among those buried in Edgar Cemetery are several persons of distinction, including Illinois Supreme Court Justice George W. Bristow, who served as Chief Justice of the state's high court from 1951-1961; publisher Edward H. Jenison, (1907-1996), Frank Trimble O'Hair (1870-1932), and Andrew Jackson Hunter (1831-1913), all of whom served as U.S. Congressional Representatives from Illinois; Colonel William Palmer Dole, who in 1861 was appointed as secretary of Indian Affairs by Abraham Lincoln; and veterans of the Revolutionary and Civil Wars, as well as other military conflicts. Veterans Circle, which was created for service men who had nowhere else to be placed, also honors all veterans interred on the grounds. Flags are erected and special ceremonies are held annually in observation of Memorial Day. Among these veterans, Otis Neal had the distinction of serving in three wars - The Mexican Revolution, World War I and World War II. An African-American, he was buried in the southeast section of the cemetery reserved in that time period for people of color. Today, monuments ranging from simple to stately are nestled under a canopy of century-old trees where past meets present. The superintendent is available during office hours in the office near the South Gate or on the grounds, Monday through Saturday, 9 a.m. to 1 p.m. or by appointment by calling 217-463-2415. Cemetery is open sunrise to sunset. Some flags displayed routinely in Edgar Cemetery are beyond repair and need to be replaced. 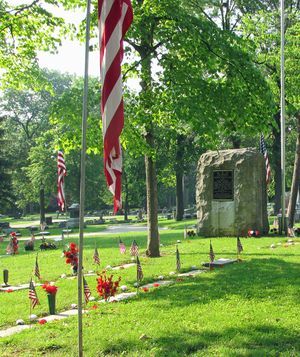 A “Flag Fund” has been established to help the cemetery maintain and expand its flag display. You can read the entire story and see how you can help by clicking HERE! Printable maps are now available for Edgar Cemetery and all Sections. Select “Maps” from the menu at the top of any page to see the complete Edgar Cemetery Map or view a particular Section more closely. Click on the printer icon to print the map. Pioneer graves on this burial ground predate the 1858 establishment of Edgar Cemetery. Copyright © 2019 Edgar Cemetery. All Rights Reserved.